Offsetting is a way in which individuals and organisations can help reduce the damage caused by the carbon dioxide emissions for which they are responsible. We think the most important response to the threat of climate change is to change how we all live, reducing the amount of carbon pollution we produce. Offsetting, by buying carbon credits, is a useful approach to dealing with the carbon emissions that remain. By conserving and expanding natural carbon sinks we can help reduce the speed and effects of climate change. Conserving mangrove forests ensures that the carbon stored in these trees remains there far into the future. Buying these carbon credits will help you reduce their carbon footprints, and well as supporting the local development of the two communities involved in the Mikoko Pamoja Project, Gazi and Macongeni. 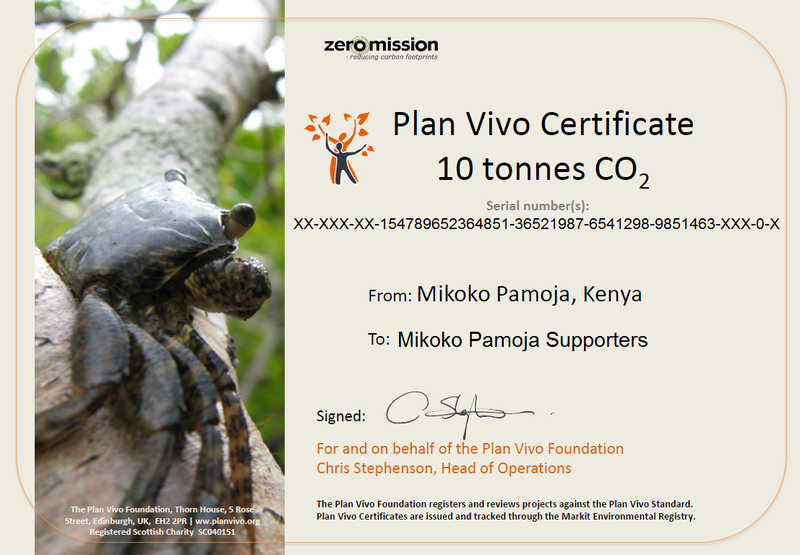 All carbon credits are issued by an independent third party NGO, the Plan Vivo Foundation. In order to prevent double-selling, all credits bought are then listed by the virtual carbon credit Markit Registry. We are able to issue all credits that meet a minimum of 10 tonnes/purchase. This is due to added costs associated with issuing community credits from third parties. We do this to maintain a high level of accountability and transparency, and feel this is vital, despite the added cost. So if you are a corporation, business, institution or individual who would like to reduce their carbon footprints, then please do not hesitate to contact us for further information regarding the cost and purchase of these credits, or visit the Plan Vivo Foundation. The link below is an example of the certificate you will be issued as proof of your purchase. Calculate your carbon footprint here.